As of only a few months ago, the name Denis Villeneuve meant nothing to me. Not only had I never seen a film of his, the name itself wasn't even on my radar. That changed when I saw the brilliant, atmospheric 2013 thriller Prisoners, a work that was littered with names I was familiar with like Hugh Jackman, Jake Gyllenhaal, Viola Davis, Maria Bello, Terrence Howard, Melissa Leo, Paul Dano, and the masterful cinematographer Roger Deakins, yet the first thing I had to do after the film concluded was to head to IMDB and figure out who this Villeneuve fella was. The disturbing and ominous tone of Prisoners left an indelible impression on me, and I knew I had to absorb more that the man had to offer. My second Villeneuve journey came when I experienced the wonderful cinematic mind melt known as Enemy, a film likely locked into a top ten slot for 2014 despite it only being May. Much like with Prisoners, Villeneuve teams up with Gyllenhaal and the choice is an example of spot on casting, as if the auteur produces material that brings out the best of Jake and his nuanced talent. That is where the comparisons between the two films end however, and that is meant as a compliment rather than a complaint. It was quickly evident that Villeneuve was no one trick pony, as Enemy was a far more challenging and confounding slice of cinema, one that will leave viewers scrambling for answers to unlock its mysteries. I for one love to be left in the dark when it comes to films that are more abstract, as piecing together my own puzzle is far more fun than having a complete understanding of exactly what the filmmakers vision was. After diving into two of his films, one thing became very clear about the work of Denis Villeneuve: the man creates haunting, memorable and important cinema. Months later, I cannot shake Prisoners from my mind, as I still think of various sequences from time to time and I will simultaneously smile and also feel my skin crawl from the mood and imagery of that film. On paper, Enemy was a fascinating concept, the idea of recognizing your exact double while watching a film and the search for answers as to how someone unrelated to you could be a true doppelganger in every possible sense, and the movie didn't disappoint as the idea was wonderfully realized and executed in a way I could never possibly forget. I knew I had to seek out one of his previous works and see if his style was always so exciting and hypnotic, which lead me to the film Incendies. Nominated for the Best Foreign Language Film Oscar in 2011, I was confident that I would be witnessing another very good effort with Incendies, and yet somehow I am still in total awe over how spectacular of an achievement it turned out to be. 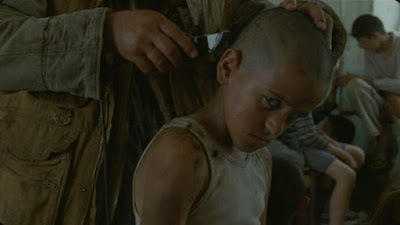 The opening scene of the film consisted of some attention grabbing imagery of various young boys getting their heads shaved as the always incredible music of Radiohead played over it. Two minutes into the film and I already knew I was in for a treat, a sequence worthy of the reputation Villeneuve has already earned with me for creating lasting, unforgettable moments despite the limited amount of time I had spent wrapping my mind around his work overall. The remaining 137 minutes did not disappoint, as I was beyond riveted by the story of the twins, Jeanne and Simon, as they honor the final wishes of their recently deceased mother by going on a journey to the Middle East to discover and better understand the messy and troubling roots of their family. The unique narrative of the film shows us the original actions of their mother earlier in her life and also their search for the answers they seek, and Villeneuve's camera is masterful throughout, an expert in mature filmmaking that knows just how to frame his subjects and their circumstances to elicit the most powerful reaction from us, the viewers. Incendies is also beautifully performed by the cast across the board, so much so that this work of fiction felt consistently natural and authentic throughout. I was invested in this film from the first frame to the last, at times disturbed when an unfortunately realistic lack of humanity was showcased, but also emotionally invested by their journey and the direction it takes them. One masterpiece could be a lucky accident. Two means a visionary talent might in fact be making his mark. Three films, however, is definitive proof that a truly special and extraordinary director has emerged, a new addition to a short list of filmmakers that deserve to have each new release circled on the calender without even so much as a plot synopsis yet released. Some need a recognizable star in the lead role, an exciting story to draw them into the theater, or a promise of stunning special effects to peak their interest enough to lay down the cash at the box office. I only need one reason to be excited for a film called Sicario, slated for a 2015 release: Denis Villeneuve.